During the 707 era, Qantas operated two Hawker Siddeley HS-125 Series 3B business jets for crew training purposes. At this time, it was necessary for Second Officers to undertake recency training in an aircraft, as flight simulators, although widely used in Qantas, had not reached the required level of fidelity for the necessary training to be done in the simulator. The use of a 707 for this training was not viable, both in terms of cost and aircraft availability. Although Qantas retained two DC-3s for crew training (VH-EDC and VH-EDD) there was a requirement for a more modern type. Another factor which led to the acquisition of the HS-125s was the loss of PNG domestic operations to TAA in August 1960 which deprived Qantas of this useful training ground. Thus, on 8 September 1964, Qantas announced an order for two HS-125s. The choice of the HS-125, it was later claimed by then Vice-Chairman, R.R. Law-Smith, was an offset for Qantas being given traffic rights between London and Bermuda. As the Qantas fleet then comprised mainly Boeing 707s, the HS-125s ordered by Qantas had several modifications to make their handling approximate that of the 707 under certain conditions. The rudder bias system was provided with an adjustment so that it could be made to simulate the foot-force required in a 707 with one or two engines out. The Qantas HS-125 also incorporated the artificial horizon and the Collins navigation system from the 707, but otherwise it was a standard HS-125. Apart from their primary role as crew trainers, the HS-125s occasionally served as company executive aircraft and also featured in promotional tours for new fares and tour packages. In January 1970, VH-ECF competed with distinction in the BP England to Australia Air Race, achieving first place in the jet section with a total elapsed time of 27 hours 30 minutes 29 seconds. Although the term is now used as a generic description of any small jet, the HS-125 was probably one of the first types to be affectionately known as the "Pocket Rocket". 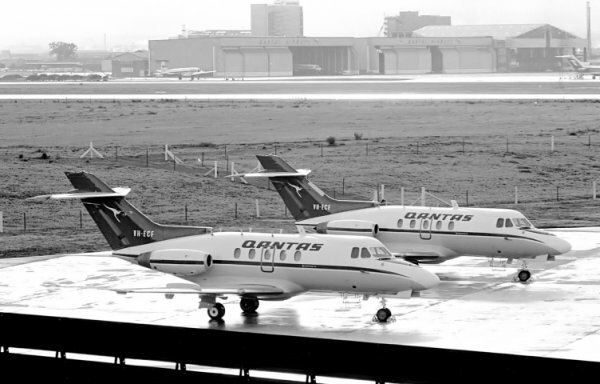 As they were not used on revenue services, the HS-125s were not given individual names during their time with Qantas. However, one of the aircraft was unofficially named "Mouse" for a very brief period in late 1967 or early 1968. 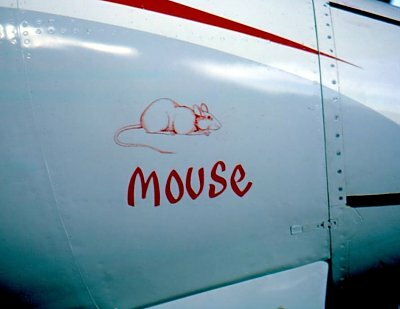 The short-lived artwork was applied by a Qantas painter in Hangar 85 and despite having been painted on the starboard side only, soon came to the attention of management who ordered its removal. It is not known which aircraft carried the name although VH-ECE is emerging as the prime suspect. As the need for the HS-125s diminished with advances in flight simulators, VH-ECF was sold in late 1972 to McAlpine Aviation in the United Kingdom, leaving VH-ECE to soldier on alone. During 1973, VH-ECE was examined by Adastra Aerial Surveys with a view to fitting an RC9 survey camera into an HS-125 for high altitude photography. A subsequent flight evaluation of an HS-125 belonging to another operator was unsatisfactory and the project was never proceeded with (read more here). In October 1981, VH-ECE was sold to Qantas Flight Engineer, Grahame Onus and stored at The Oaks where the aeroplane is now derelict. The former VH-ECF was sadly destroyed in a fatal crash near Columbia, Montana in January 1990. Leased to the Dept. of Civil Aviation from March to July 1967 while VH-CAO was being repaired. Currently stored in derelict condition at The Oaks, NSW. 06JAN68 Landed at Oakey to transport the Mayoress of Toowoomba to Sydney for the naming ceremony of the new Boeing 707-338C VH-EAA City of Toowoomba. 20NOV72 Departed Sydney in an all-white scheme for the U.K.
27NOV72 Sold to McAlpine Aviation Ltd, as G-BAXL. Sold to Dennis Vanguard Intl (Switchgear) Ltd as G-BAXL. 25JUL89 Registered G-OBOB to Slender You (UK) Ltd.
30JAN90 Crashed and written off near Columbia, Montana, USA. Qantas was not the only Australian operator of the HS-125, nor was it the first. On 20 January 1965, HS-125-1B VH-CAO (msn 25015) arrived at Essendon on delivery to the Department of Civil Aviation. The aircraft was used principally for the purpose of providing jet experience for the Department's Examiners of Airmen although it was also used for other DCA needs and occasional VIP transport. It was not, as is popularly believed, equipped for navaid calibration. VH-CAO featured in a widely publicised incident when it was inadvertently landed wheels-up at Avalon, Vic on 24 January 1967. While the aircraft was being repaired by Hawker de Havilland at Bankstown, NSW, the DCA leased VH-ECE from Qantas until July 1967 when VH-CAO returned to service. During its lease to the DCA, VH-ECE operated in full Qantas livery and no additional DCA titles were carried. During its repairs, VH-CAO was fitted with new Viper 522 engines in place of the earlier Viper 521s and thus emerged as an HS-125-3B. Such was the damage caused by the belly landing, that VH-CAO had to be fitted with a new wing. When the aircraft was recovered from the Avalon runway, poor placement of lifting straps caused some minor wrinkling of the fuselage aft of the cockpit. It had been hoped that these wrinkles would disappear after several pressurisation cycles but they never did. VH-CAO served the Department until 1 August 1978 when ownership was transferred to Arnjul Pty. Ltd. of Auburn, NSW. Coincidentally, at the time of writing, VH-ECE and VH-CAO both cling to life, seemingly abandoned in outdoor storage at The Oaks, NSW and both owned by the same person. It is to be hoped that their owner will take steps to ensure the preservation of these historic aeroplanes. VH-CAO landed wheels-up at Avalon, Vic. VH-CAO arrived at Bankstown, NSW on two trucks. VH-ECE arrived at Essendon, Vic on lease to DCA. VH-CAO returned to Essendon after repairs at Bankstown. VH-ECE was returned to Qantas around this time. VH-CAO became the first fixed wing aircraft to land at Melbourne's new Tullamarine Airport. On board were the Minister for Civil Aviation and the Director General of Civil Aviation. HS-125-3B/RA (msn 25169) delivered to Bell Brothers Air Charter Pty. Ltd., Guildford, WA in January 1970 and sold overseas in June 1972. HS-125-400B (msn 25242) delivered to Tom the Cheap (WA) Pty. Ltd., Perth, WA in January 1971 and sold overseas in December 1973. The Australian Register also included several later versions of the HS-125 under various designations. Added the date that VH-ECF departed SYD for the UK. Thanks to Gordon Reid and Essendon Newsletter 62/65 OCT72. Added the date that DCA disposed of VH-CAO (01AUG78). Thanks to Tony Arbon. Added a reference to other Australian operators of the HS-125 and the lease of VH-ECE to the Department of Civil Aviation while VH-CAO was under repair. Thanks to Geoff Goodall, Gordon Reid and Ted Dewey. Further references to "Mouse" were added thanks to Roger Chin. Also added recent images of VH-ECE and VH-CAO at The Oaks thanks to Rod Hobson. Added a reference to "Mouse".